England vice-captain Rio Ferdinand has hit out at Fifa's approach to racist behaviour among fans, accusing world football's governing body of weakness. Croatia fans targeted England players, and Emile Heskey in particular, during England's 4-1 win in Zagreb last month. The Croatian FA was fined £15,000, but Ferdinand told BBC Radio 5 Live: "Fifa make comments about what they will do but never back it up with actions. "The football authorities need to take a look at themselves." Ferdinand, speaking ahead of England's World Cup qualifiers against Kazakhstan and Belarus, added: "Croatia were fined a few thousand quid. What's that going to do? That is not going to stop people shouting racist or homophobic abuse. "(Fifa president) Sepp Blatter likes to speak up about things that are good for Fifa's image but I would love to see them stand up and dish out the right punishments for these incidents. "If things like this keep happening you have to take points off them. Then the punters will realise the team is going to be punished." Fifa did not want to respond directly to Ferdinand's remarks but said in a statement: "Fifa and Fifa president Joseph Blatter take the fight against racism in football very seriously. "Fifa not only speaks very clearly about this issue, but carries out several campaigns and projects." 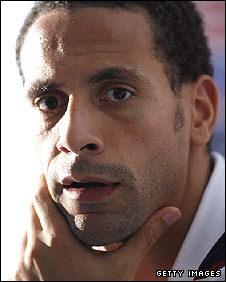 Ferdinand was also asked about the alleged abuse directed at Portsmouth defender Sol Campbell by Tottenham fans at Fratton Park last week. And the 30-year-old was unequivocal in his response, saying: "The high-tech cameras should be able to pick up the people who are doing that kind of stuff and eject them from the ground. That is the only way I can see to stop it happening. "We are talking about a football match. There are young kids present who want to be entertained, not hear someone a couple of rows back slagging players off." Portsmouth reported the alleged abuse at Fratton Park to the Football Association, who said it would issue life bans to any fan it could prove was connected. Complaints from Portsmouth fans after the match were made to Hampshire Police, who initially said they could not take action due to the number of people involved.